We produce quality artisan crafted Gold and Silver Bands and Rings made in Durango, Colorado USA. We have been producers of some of the best Southwestern styled Silver Jewelry coming out of the Southwest for many decades as well as generations of our family. We specialize in Turquoise Rings with very high quality Turquoise that we mine and have collected, we also specialize in Gold and Silver Bands of many types that have a Southwestern and Victorian Southwest style. We invite you to check out what we have and we also invite you to read on to find soon useful information in this Bands and Rings presentation page. Our Silver Jewelry and our Bands and Rings are substantially different from most that you will find available, they are only available at Historic Trading Post in Durango Colorado USA or at our Online Silver Gallery searchable from the text links to the left of this page. If you are considering a Silver Ring Band, we invite you to check out our ever growing selection of high quality handmade Bands and Rings - they are unusually different! Below are several examples of the type of Bands and Rings that we carry. Our inventory is constantly changing as well as growing! Above are a couple of Bands and Rings created by John Hartman to be worn by both men and women. The center of these ring bands are rounded with a texture similar to sandstone. The Band Ring on the left has Silver domes on each side of the textured band going all the way around the band. The Ring Band on the right has hand stamped groves that have been filed round to create a scalloped design. Both of these Bands and Rings are unique from others that you will find available at any other location other than Durango Silver Company, and they are proudly made in the USA. To the left is a Bisbee Turquoise Ring in Sterling Silver by Dillon Hartman. 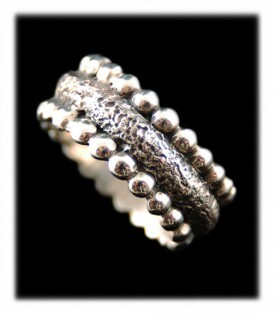 This Silver Ring would be great as a men’s ring or a women’s ring. 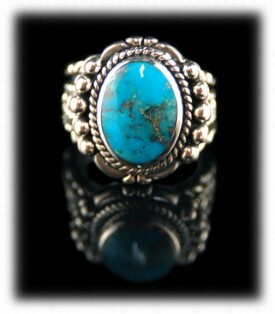 The focus of this ring is an oval cabochon of deep blue Bisbee Turquoise from Bisbee, Arizona USA. The Bisbee Turquoise cabochon is bezel set and surrounded by a rope or cable design, which is then surrounded by saw work and raindrop designs. This is all set a top a heavy Silver Band. Bisbee Turquoise Bands and Rings are very difficult to find, read more about Bisbee Turquoise at BisbeeTurquoise.com. 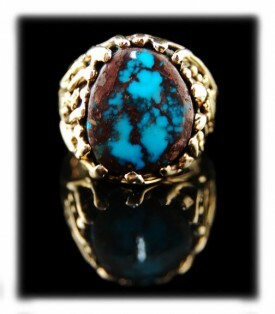 To the right is a fabulously crafted Mens Gold Bisbee Turquoise Ring. This rare American Turquoise cabochon is accented by gold nuggets from Silverton, Colorado USA and the entire Ring was created in 14ky Gold.. This Colorado Gold Nugget and Bisbee Turquoise Ring was modeled after tree roots in nature by John Hartman, which is the master Gold and Silver Smith that founded Durango Silver Company. We try hard to always have many great Bands and Ring for your selection here at Durango Silver Company, we invite you to visit our Online Gallery often to see new items we add to our collection daily. To the right is a Lost wax style Mexican Opal Ring by Nattarika Hartman. This one of a kind lost wax style focuses on a faceted Mexican Opal Gemstone. The stone is set into a contemporary lost wax designed Sterling Silver Band Ring that is very stylish. . The Mexican Opal is a good choice if you are into Metaphysical healing and are looking to enhance or heal your Sacral Chakra. 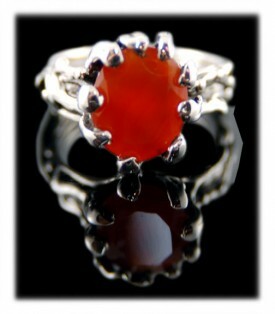 Many believe fire opal to be energizing, giving strength and endurance in stressful times. Other people like to meditate with fire opal, it is very easy to get into a meditative state by simply gazing at the incredible color's of this opal. 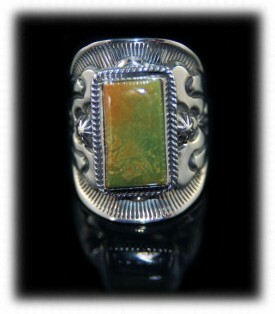 Above are two Bands and Rings produced by Durango Silver Company. To the left is a White Buffalo Turquoise Ring by Dillon and John Hartman. This Silver Band Ring has a White Turquoise Gemstone in a simplistic and sleek designed Saddle style Band created by John Hartman, this is one of the most comfortable Band Rings you will ever wear. Dillon Hartman inlaid this Ring with White Buffalo Turquoise which really sets this design off nicely. 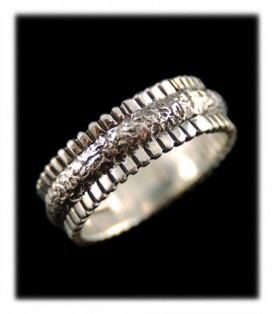 Men love this style of Band Ring from Durango Silver Company as they are sleek and comfortable to wear. To the right is a Sterling silver, Gold Nugget and Italian Red Coral Ring by John Hartman. 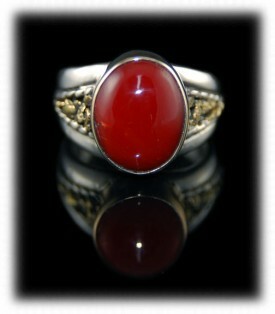 This stunning Band Ring focuses on a Mediterranean Coral Gem from Italy. This gorgeous piece of Coral is set in a 14k gold bezel and sits atop a heavy sterling silver band which is inlaid with natural gold nuggets from Silverton, Colorado USA. Bands and Rings such as this are very uncommon and seldom scene available. 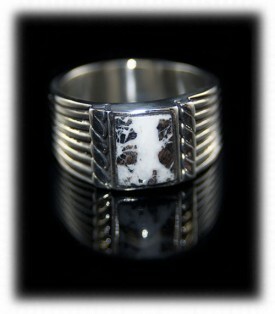 Above and to the left is a Native American handmade Manassa Turquoise silver Ring by Navajo artist Derrick Gordon. This Silver Band Ring could be a mens or a women's Turquoise Ring. This Manassa Turquoise Silver Ring features some great stamp work, which Derrick is well known for. The forest green Manassa Turquoise cabochon is bezel set and surrounded by a classic cable design. 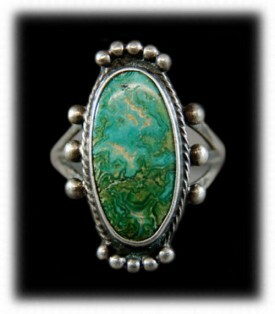 This green American Turquoise Ring would be a great addition to any Silver Jewelry or Turquoise jewelry collection. To the right is an Antique Navajo Turquoise Ring featuring a natural piece of Cerrillos Turquoise from New Mexico. 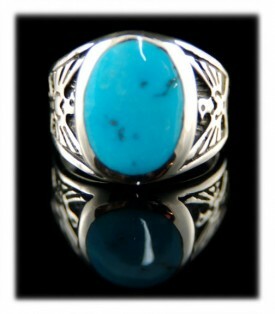 This is a very nice classic Old Navajo Turquoise Ring with a beautiful green Turquoise stone and a wonderful design. 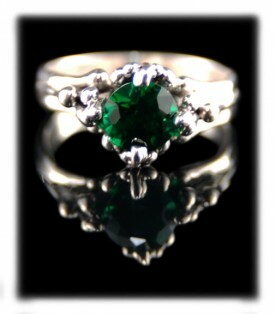 It was a well made ring in its time - from approximately 1930. Many individuals love Antique Navajo Silver Jewelry, it is high collected and admired worldwide by many. Antique Navajo Bands and Rings are a pleasure to own and wear, Durango Silver Company has old Silver Jewelry available often - see what we have today and come back often as we add new pieces daily. Also, check out these presentation pages - Silver Jewelry - Silver Ring Bands - and check out our sister site for Bands and Rings as there is some great additional photos and information on Bands and Rings. We hope you have enjoyed our presentation on Bands and Rings and have gained some useful knowledge from our information page. We invite you to learn more about Silver Jewelry, Native American Jewelry and Turquoise Jewelry by following the links in our Learning Center to other informational pages that we have written on different topics related to Silver Jewelry as well as Bands and Rings. In addition, we would like to invite you to join our E-Mail Newsletter - about once every other month we send out a Newsletter to inform our members of what's happening at Durango Silver Company, our new products, specials for our members only and more. We also have a monthly drawing from our member base to give away free Silver Jewelry from our company. Please take a moment to become one of our friends by signing in below. We hope you have enjoyed our presentation on Bands and Rings we also hope you will think of Durango Silver Company the next time you are considering Bands and Rings.